A rich Virginia tobacco, complemented by subtle hints of hazelnut, caramel and Madagascan vanilla with a luxurious espresso finish. A sophisticated and complex blend, for the discerning tobacco connoisseur. All served up at a crazy low price both wholesale and retail. This range comes in a 70ml bottle with 50ml of juice inside and is shortfill compatible. Add x 2 Shots to make 6mg. x1 Nic Shot is supplied free of charge with each unit. The Bottle contains ZERO nicotine. Ratio: 70 / 30 VG. 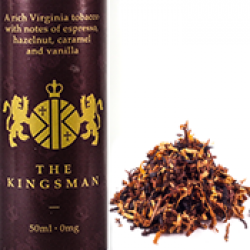 The Kingsman Tobacco e liquid. A rich Virginia tobacco, complemented by subtle hints of hazeln..